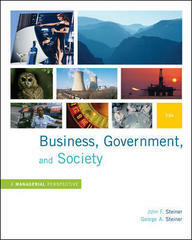 Business, Government, and Society 13 Edition The thirteenth edition of Business, Government and Society by John F. Steiner and George A. Steiner continues a long effort to tell the story of how forces in business, government, and society shape our world. In addition, an emphasis on management issues and processes allows students to apply the principles they learn to real-world situations.As always, a stream of events dictated the need for extensive revision. Accordingly, Steiner and Steiner have updated the chapters to include new ideas, events, personalities, and publications, while continuing the work of building insight into basic underlying principles, institutions, and forces.